Folks - I've made no secret of my admiration for analyst-extraordinaire, Ray Wang, who is a true dynamo in the world of software. You can read a great dialog we had with Ray earlier this year. 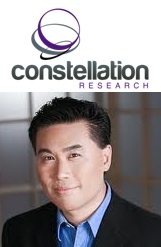 Today, Ray announced the launch of a very exciting new research venture entitled Constellation Research, which comprises a collection of really smart and remarkable individuals and friends who are - quite literally - changing the way market research, commentary and insight is being served up to the technology buyer. HfS Research is delighted to be the alliance partner for IT sourcing and BPO research to Constellation's buy-side community, where we'll be cross-pollinating some research with each other and collaborating to help educate the sourcing buyer make smarter decisions. I, personally, have really enjoyed my interactions with folks such as Vinnie Mirchandani and Dennis Howlett over several years (in fact, Dennis remembers me when I was still in my analyst nappies back in '95). We're honored at HfS to get the chance to work with such a stellar collection of cosmic energy!